I know this is a little mean, but below is an account of my transcendent experience in a chocolate shop and cafe in Berlin, Germany — where I happen to be right now. But, don’t despair. 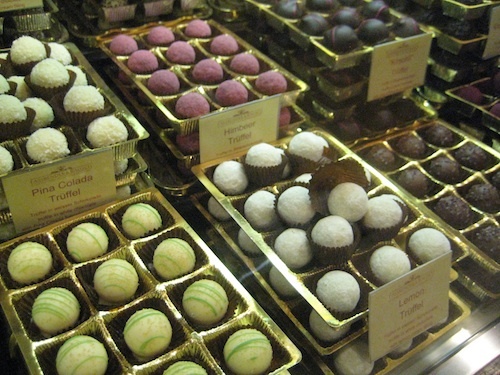 Luckily, there is a charming store in Oakland where you, too, can savor a bit of chocolate heaven, German style. Berlin’s high church of chocolate is aptly located on a classy corner near a pair of stunning eighteenth century cathedrals. My pilgrimage to the venerable Fassbender & Rausch began as I entered this 148 year-old institution and reverently beheld more than 300 varieties of chocolate confections arrayed in cases and on the shelves that line several rooms. Truffles, liqueur flavored nougats, pralines filled with every nut known to man, chocolate covered exotic fruits like pear, papaya and mangostein, armies of chocolate teddy bears and nubbly chocolate bark sprinkled with intriguing combinations of peppercorns and cornflowers, orange peel and corn flakes or sour cherries and sesame. This latter configuration of chocolate brought to mind the award-winning Michael Mischer chocolates on Oakland’s Grand Avenue, the only other place I have seen this kind of chocolate bar where the “filling” is on the top. 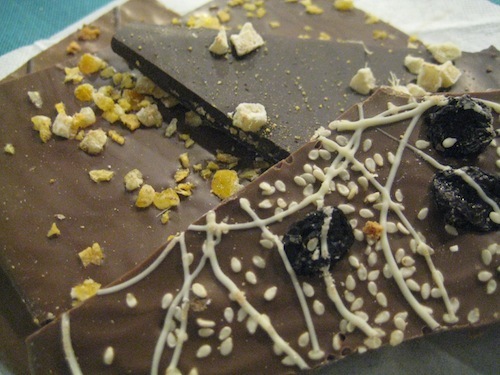 Mischer, who hails from northern Germany, fashions bars studded with everything from dragon fruit and blueberry to Australian Murray River pink sea salt. His filled chocolate pralines embody whimsy in shape and taste: like his root beer flavored mini-barrel or his latest flavor – barbeque, which I recently sampled. While I worried that the tiny treat would remind me of a handful of dripping ribs, it subtly delivered just a whiff of chocolate smoke. Back to Berlin. One thing that Herr Mischer does not have in Oakland is a chocolate restaurant. 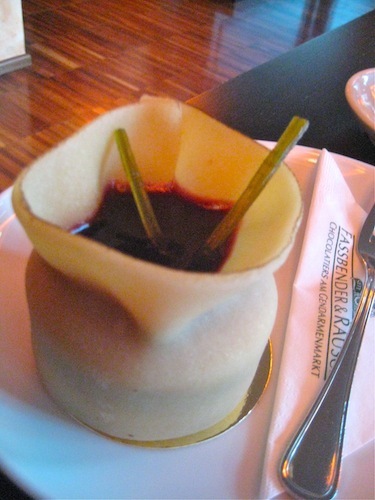 Fassbender & Rausch‘s second floor café naturally serves, coffee, tea and your choice of exquisite little cakes. But their unusual menu also lists lunch and dinner selections – soups, salads and main courses – that all include some form of chocolate: sweet potato soup swirled with chocolate ripples, chicken rice curry sprinkled with cocoa nibs, mixed green salad with chocolate-balsamic dressing, cocoa tagliatelle with tomato sauce, meatballs in chocolate sauce with mashed potatoes. It would have been a tough choice, but I happened to be there at tea time so I only had to pick a pastry. Still, I was struggling to decide between a chocolate mousse bombe and an orange parfait tartlet. But once I spotted a marzipan pouch, I knew I was saved. 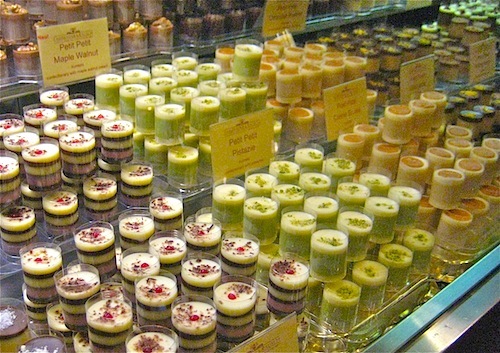 No other choice possible for a marzipan-maniac like myself. It did not disappoint. 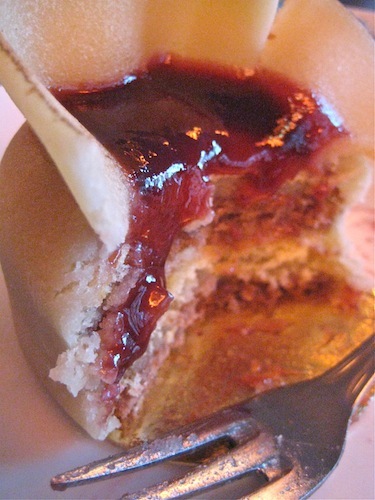 My fork eased through the outer purse of soft marzipan which encased two discs of moist chocolate cake between more layers of marzipan, topped by a dollop of red currant jelly that dripped seductively down the pastry once it was cut. Talk about a marriage of tastes! The red currant/marzipan/chocolate combo had my taste buds releasing doves, throwing rice and happily catching the bouquet. 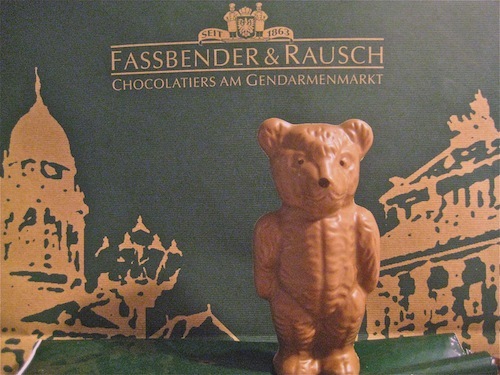 This entry was posted in German Food and tagged chocolate Berlin, Fassbender & Rausch, Michael Mischer. Bookmark the permalink. Wow this looks delicious! I stumbled across your blog and saw this post and it caught my attention because I’ve been seeking ideas for my boyfriends birthday cake (he loves German chocolate) I must visit this store now! These chocolates look like perfect gifts =) Thanks!